“Why do the Salafīs say that it’s impermissible to blindly follow the Great Imāms such as Abu Hanīfah, Mālik, Ash-Shāfi’ī and Ahmad Ibn Hanbal, yet they blindly follow the scholars such as Ibn Bāz, Ibn Uthaymīn, Al-Albānī, etc?” Question 4 in the Manhaj. 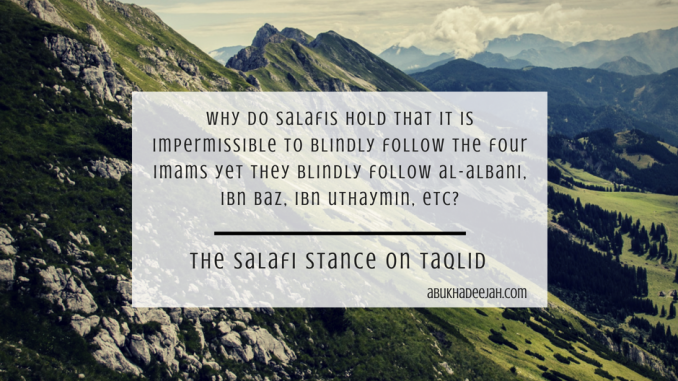 Why do the Salafīs say that it’s impermissible to blindly follow the Great Imāms such as Abu Hanīfah, Mālik, Ash-Shāfi’ī and Ahmad Ibn Hanbal, yet they blindly follow the scholars such as Ibn Bāz, Ibn Uthaymīn, Al-Albānī, and others of their like? This actually is a very good question, even though there maybe aspects to it that are factually incorrect. However, the question is good because it is a doubt that is spread against the Salafiyyūn that they abandon the blind following of the four Imāms but they blindly follow the scholars of today, such as Ibn Bāz, Ibn ‘Uthaymīn, al-Albāni, al-Fawzān, Rabī’ al-Madkhali, Abd al-Muhsin al-‘Abbād, Muqbil Ibn Hādi, and other than them. “Follow [make ittibā’ of] that which has been revealed to you from your Lord and do not follow other than that from friends and protectors besides Allāh. And little is it that you take admonition.” So Allāh has commanded here with ittibā, i.e. following the Revelation and not blindly following without proof. So in the Qur’ān you find the command, “Ittabi’ū” i.e. follow! Allāh does not mention or command with taqlīd because taqlīd means to blindly follow not knowing the Revelation, and not knowing the evidence, and not knowing what Allāh and His Messenger have said. This is the origin of the affair for every Muslim that which he has been commanded with. However, a situation may arise that an issue is too complex or too difficult for a Muslim to comprehend. So he needs the help of scholars because the issue may not be clear cut to him, or that he is illiterate, or that he has not studied Islām well enough to comprehend certain rulings. And of-course Muslims from the general folk are not commanded to come to their own juristic opinions or to make ijtihād. It is not upon the average Muslim to go to the Qur’ān and Sunnah to extrapolate juristic rulings from there and come to their own ijtihādāt (juristic opinions). That is for the scholars and definitely not for the general people. So there may occur situations and scenarios that came about after the time of the Prophet (sallallāhu ‘alayhi wa sallam) that may not have been present in the time of the Prophet (sallallāhu ‘alayhi wa sallam) where the scholars had to resort to using the principles of the Sharī’ah that are based upon the texts of the Qur’an and the Sunnah to come to rulings connected to Religious matters and worship. Those rulings are understood by those who have knowledge like the scholars and the grounded students of knowledge. But it may be that the way that the scholars have come to the decision may be too complex for the average person to understand and comprehend. These may be issues related to the menstrual blood of women, procedures in childbirth, fertilisation or maybe they are issues related to the complexities of modern medicine, politics, or buying and selling. Some of these matters may not have been present in the time of the Prophet (sallallāhu ‘alayhi wa sallam) but there may be a basis in the principles of Islām that are taken from verses of the Qur’ān, or hadīths, or something that the Sahābah agreed upon or that some of them may have alluded to, such that a scholar extrapolates a ruling from it. Indeed, many other issues may also be vague and ambiguous to an uneducated Muslim that are related to the Prayer, purification, fasting and Hajj, etc. — so he refers to a person of knowledge for answers just as Allah has commanded, “Ask the people of the Reminder (i.e. the Qur’an and Sunnah) if you do not know.” So the Scholar answers his questions and mentions the evidences he used in accordance to the level of understanding of the questioner. In complicated rulings, if a student of knowledge were to sit with the ‘ālim (scholar) for a period of time he may understand how the scholar came to his conclusion — that is because the student of knowledge has a grasp of the principles of the Sharī’ah. Once he understands where the ruling came from he has made ittibā’ because he has understood the evidences, the roots, and the foundation of that evidence. But some of the people may not have the ability to comprehend those evidences and proofs because that may require knowledge of the principles related to Islamic Jurisprudence, usūl al-fiqh, or the usūl of tafsīr, understanding the abrogating verses and the verses that has been abrogated (al-nāsikh wal-mansūkh). And this goes also for hadīth too — whether a particular hadīth is authentic, or whether it can be used in a specific situation. So the ruling may not always be clear-cut. What does the general Muslim do in that situation? He takes from an ‘ālim who is worthy of taking from. A Scholar of Sunnah and Salafiyyah, who is a person capable of ijtihād, and he makes taqlīd of him in that situation. This is the position of Shaykh al-Albānī (rahimahullāh) and the rest of the Salafi Scholars. When Shaykh al-Albānī (rahimahullāh) was accused of forbidding taqlīd in all of its forms he refuted the accusation and explained that the prohibition of taqlīd is not absolute. He stated that some people have no choice but to make taqlīd. And one should take the fatāwa of an ‘ālim who is worthy that his fatāwā are taken because he is an ‘ālim of Ahl as-Sunnah and Hadīth, who understands the proofs and the principles of the Religion — and of course, his ‘Aqīdah and his methodology are correct, upon the Madhhab of the Salaf. His fatāwa cannot be accepted if he is an opposer of the ‘aqīdah of the likes of Mālik, Ahmad, Bukhārī, Muslim, Tirmidhī, Barbahārī, Ibn Qudāmah, Ibn Battah, Al-Lālikā’ī, Abdul-Ghanī Al-Maqdisī, Ibn Taymiyyah, Ibn al-Qayyim, Ibn Abd al-Wahhāb, and the other well-known scholars of Qur’an and Hadīth. And the one who dislikes or shows enmity to the beliefs of these great Imāms, then knowledge is not to be taken from him in any affair of religion as Ibn Sīrīn (rahimahullāh) stated, “Indeed this knowledge is Religion, so look (show care) from whom you take your Religion.” (Al-Muqaddimah of Sahīh Muslim) Likewise, knowledge of the Religion and fatāwa are not to be sought from a person who himself is a blind-follower (muqallid) because the muqallid is not a scholar by ijmā’ (agreement) of the People of Knowledge. Innovators and innovated sects too must be avoided when seeking knowledge and fatāwa since their rulings will be biased and inclined to misguidance — so one should not seek ‘ilm from the Jahmiyyah, Mu’tazilah, Ash’ariyyah, Māturīdiyyah, Jamā’at At-Tablīgh, Al-Ikhwān Al-Muslimīn, Al-Qutubiyyah, Khawārij, Shi’ah, Al-Qā’idah, Sufiyyah (esoteric seekers of ‘hidden knowledge’), Qubūriyyah (venerators and worshippers of the graves), etc. All of these sects (old and new) have deviated away from the Path of the Prophet and his Companions. It is not a condition that before one acts upon the fatwā of a Scholar, the person must understand and comprehend the proofs behind the fatwā — meaning that an ‘ālim knows the proofs and principles upon which his fatwā is based, but that may not be something that the uneducated or unqualified Muslim understands — so just because a Muslim does not comprehend the proofs and principles is a not an excuse to withhold from accepting the fatwā. Indeed, Shaykh al-Albānī stated that to make it a condition that one must comprehend the proofs before acting on a ruling (edict or fatwā) issued by a scholar is from the innovated madhhab of the Mu’tazilah sect of Basrah as Al-Khatīb Al-Baghdādī stated in his book Al-Faqīh wal-Mutafaqqih. Therefore, we do not say about every single fatwā for every single person that he must understand the source of the evidence before acting upon the fatwā. And example: A man divorced his wife and there are several complications in his divorce. Maybe he divorced her with anger, so the scholar may ask which type of anger it was because a man does not divorce his wife when he is pleased with her! He divorces her when he is angry and upset with her. But he may regret what he said because his anger was extreme that caused him to lose control of his thought process or speech. So the ‘ālim will say “Were you angry?” and the man may say, “Yes.” The scholar will then ask which type of anger it was because anger, as Shaykh Ibn Bāz (rahimahullāh) said is of three types. The anger which is a general type of anger which is understandable because a man who divorces his wife is angry and upset with her. Or was it the anger that was like a rage? He was enraged with her and was in control to a degree, but spoke withou thought and control, then this divorce is not counted, meaning that it was the anger that made him divorce her. And the third type of anger is the anger where he did not know what he was saying at all because he was so enraged. Here you can see that anger is of different levels. Then, there may be added complications to this situation — so this man says to the scholar that his wife was menstruating at that time; he says that he cannot remember if it was the second or the third divorce he gave her; and that she cannot remember either; and there were no witnesses. These are real-life scenarios amongst general Muslims — no so much among Salafis, alhamdulillāh. So now the man asks the Shaykh if he is allowed spend the night with her. For this man to understand all of the complexities of what he has asked the ‘ālim would require for him to sit with this scholar for maybe a week, or even longer, and even then he may not understand because there are different opinions and evidences among the scholars. Shaykh al-Albāni said that in these types of situations the Mufti of this general person is the scholar of Ahlul-Sunnah and Salafiyyah of his land. It is not to be said that taqlīd is absolutely forbidden for him because in certain fatāwā he may have to make taqlīd, otherwise, so what does he do!? Another case is that a woman is bleeding and her bleeding is prolonged. She cannot tell the difference between istihādah and her menstrual cycle, and she cannot comprehend the complexities. She has read a few ahādīth but they do not make her affair easier in understanding. The bleeding stops and starts and it is connected to some medicine that she has taken. She needs to know whether she should pray the next prayer or not. By the time she understands the answer, a week may have passed, or two weeks, or maybe she never understands the answer because these are issues of complexity. So in that situation she has to make taqlīd of the Scholar. Furthermore, we should understand Ahl as-Sunnah wal-Jamā’ah (the Salafis) do not say that we blindly follow Shaykh Ibn Bāz or Shaykh Ibn ‘Uthaymīn, or Shaykh al-Albānī, or Imām Abū Hanīfah, or Imām ash-Shāfi’ī in everything they rule upon. We do not say that. Rather, the fundamental principle is that we seek proofs, and we try and understand them, as that is light from Allah, the Qur’an and Sunnah, it is Revelation. We say that we follow these Imāms based upon authentic evidence they provide in the details of belief, how we pray, how we fast, how we understand the religion, in the affairs of Jurisprudence, in affairs of fatāwā. We take from these great scholars, like ash-Shāfi’ī, Abū Hanīfah, Ibn Taymiyyah, ‘Abd ar-Rahmān as-Sa’dī, al-Fawzān, Rabī’ al-Madkhalī, ‘Ubayd al-Jābirī — also Ibn Qudāmah the author Al-Mughnī in fiqh, an-Nawawī, and from the scholars of each era. We take from the statements of the scholars in accordance with their evidences. The origin of Ahl as-Sunnah is to take the rulings and the positions of the scholars based upon their evidence, not that the average person regards himself to be a mujtahid, or someone who can interpret the verses of the Qur’ān and the ahādīth by himself. He needs an ‘ālim from Ahl as-Sunnah. An ‘ālim whose ‘ilm is to be taken because it is worthy of being taken. This is how we understand the following of the great scholars. We do not blindly follow Ibn Bāz, or Ibn ‘Uthaymīn, or al-Albānī, or Fawzān, or other than them. We do not blindly follow them, rather we look into their evidences because that is the origin, al-ittibā’. And if today a person holds a position from one scholar, but a few weeks later it is found that his position opposes an authentic hadith and what a group of Sahabah were upon, then the Sunni leaves his original position in favour of the proofs. And the ‘ulamā’ have differed in many affairs but as far as their ‘Aqīdah is concerned then their ‘Aqīdah is one and their methodology is one. If an ‘ālim has an ‘Aqīdah that is faulty or corrupted, maybe his ‘Aqīdah is of the Mu’tazilah, then we avoid him. As for an ‘ālim who has slipped in a particular affair, then that affair is referred back to the ‘ulamā’ and the ‘ulamā’ will explain to you what is to be taken and what is not to be taken. Nevertheless, in general, we say that the general folk, the people in general, and Ahl as-Sunnah do not take knowledge from Ahl al-Bid’ah, not in Fiqh, not in ‘Aqīdah, not in Manhaj. We don’t take from Ahl al-Bid’ah: like the Mu’tazilah, the Sūfiyyah, Jamā’at at-Tablīgh, the Ikhwān al-Muflisīn, the Qutbiyyīn, the Jamā’at at-Takfīr, the Jahmiyyah, and the Ashā’irah. We don’t take knowledge from these sects. Why? Because their foundations are not the foundations of the Book and the Sunnah, and the understanding of the Sahābah. Their foundations are their ‘aql (intellects), their hawā (desires) and fanatical allegiance to their sects. If the Kitāb and the Sunnah agree with their intellects, they say that they take from the Kitāb and the Sunnah. When the Kitāb and the Sunnah oppose their limited intellects, they abandon the Kitāb and the Sunnah and they return to their intellects. We do not disrespect any of the scholars or any of the Sahābah but if there is a difference between the scholars, or there is a difference between the Sahābah, or there is a difference between the students of knowledge, then the affair refers back to the Kitāb and the Sunnah for judgement. Imām Mālik Ibn Anas (rahimahullāhu ta’ālā) said: “Everyone’s speech is either accepted or it is rejected, except for the companion of this grave.” And he pointed towards the grave of the Prophet (sallallāhu ‘alayhi wa sallam). Imām Mālik was a scholar of Madīnah. Likewise, Imām Abū Hanīfah (rahimahullāhu ta’ālā) said: “If a hadīth comes from Allāh’s Messenger (sallallāhu ‘alayhi wa sallam) then I accept it completely and without any objection. And if a hadīth comes from the companions of Allāh’s Messenger (sallallāhu ‘alayhi wa sallam) then I will accept it with a complete acceptance. And if there comes speech from the Tābi’īn, then they are men and we are men.” Meaning: that after the narrations of the Sahabah, we measure the speech of those who come after them: does it agree with the Kitāb, and the Sunnah, and the Sahābah? If it agrees with the Book, and the Sunnah, and the Sahābah, then we accept it. But otherwise, they are men like we are men, meaning scholars of Sunnah. These are the scholars of that era and the scholars of today are no different. So no, the Salafīs do not blindly follow, but they will take the fatwa of an ‘ālim who is worthy that his fatāwā are taken because he is an ‘ālim of Ahl as-Sunnah, and he is an ‘ālim of Salafiyyah, upon the ‘Aqīdah of Salafiyyah and upon the Manhaj of Salafiyyah. Then, yes, we take from him, bārakallāhu fīkum. “Ask the people of knowledge if you do not know, with the evidences and with the Scripture…” Those ‘ulamā’ of Ahl as-Sunnah speak with evidences and Scripture, so go to them if you do not know an affair. Allāh has commanded that you to go to the scholars to ask them. This is not blind following, this is to obey the Command of Allāh. This is my answer to this question (bārakallāhu fīkum).